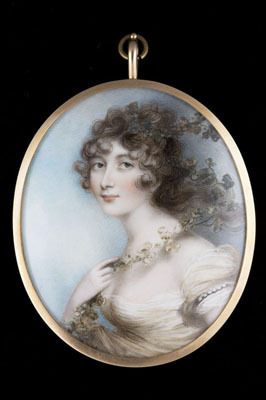 To view portrait miniatures for sale, please visit the Miniatures page at www.philipmould.com. This portrait of the beautiful Lady Whitbread is arguably one of Plimer’s finest portrait miniatures. It is certainly an ambitious composition, which is unusual in that the artist has included the sitter’s hand. The portrait is also full of movement – another rare attribute in portrait miniatures of this date and one usually more readily ascribed to Plimer’s former employer, Richard Cosway.